News from the P.V. 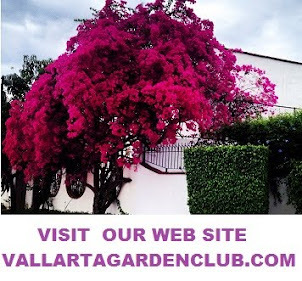 Garden Club – Beautifying Vallarta! First, we want to acknowledge that our work as a club is only as effective as the partnership we build with the city and its residents. Eduardo Garcia Joya, Oficio de Turismo PV, is now our best ally and has been very helpful. He organized the work of the employees of Parque y Jardines to prune some of our trees on Basilio Badillo. They did a great job and it was necessary to be a bit more drastic when it came to pruning. We planted Primavera Trees there several years ago, having been told that the electrical wiring would be underground when the trees reached maturity. We are still hopeful this will happen some time soon, but until then, we need to assure the trees and bougainvillea are in proportion. “The Pier Street”, Francisca Rodriguez, is a work in progress. We are investigating how much it would cost to finish the street using the same pattern that currently exists in front of Archie’s Wok. The benches have been privately commissioned by an artist, Natasha Moraga and add character to the street. Eduardo also has plans to install artwork parallel to the Malecon so people have an additional incentive to frequent the shops there. For those of us involved in beautifying Vallarta it is wrenching to depart, but a good percentage of our board remains in PV most of the summer. We are monitoring the status of the new plantings on Francisca Rodriguez and assisting our gardener who continues to work for us. A meeting next week will be convened to discuss among other items, a proposal for Pulpito Plaza, recent vandalism of one of the trees and bougainvillea plantings on Insurgentes and the concern over previous vandalism, tile sponsors for the pier street, and plans for the club this Fall.